1. Will Harcombe’s paper just came out in PLoS Computational Biology. We are both extremely relieved and proud to have gotten this out, as it represents the first direct test ever as to whether central metabolic fluxes actually evolve to become optimal, as proposed by flux balance analysis. The answer is yes and no; strains that were already close to the optimum (for yield) actually evolved to be slightly further away from optimal than their ancestor. On the other hand, sub-optimal strains evolved to be closer. As Will very nicely put it, “FBA can either predict how you are or what you’ll become, but not both”. 2. We’ve been on a roll with Faculty of 1000! 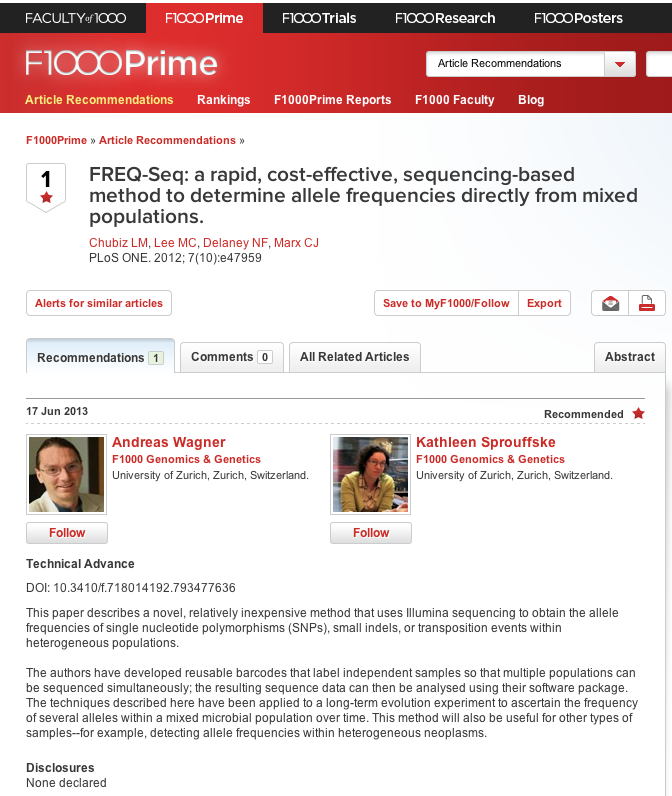 Lon and Miki’s PLoS One paper on FREQ-Seq to quantify allele frequencies cheaply and easily was kindly recommended by Andreas Wagner and Kathleen Sprouffske. Furthermore, our full FREQ-Seq kit is now available from Addgene.com, and they kindly wrote us up in their Summer Hot Articles newsletter. 3. I was very honored to have been nominated for a Star Family Prize for Excellence in Advising Harvard College undergraduates. 4. Finally, we have said goodbye and well wishes to Alex Betts, who visited us as an Erasmus Mundus visiting Master’s student (now on his way to a Ph.D. program at Oxford), and have welcomed Tim Scott, an visiting undergraduate student from University of Florida who joins us for the summer. This entry was posted in publications, research on June 23, 2013 by cmarx2014.